Apologies to Sir Walter Scott. So, the consult with the RE was AWFUL. Hubby was confused about where to meet and missed the whole thing. He paid dearly for it (sorry hubby!). Usually doctors are the only ones who give us any hope, but this one didn't seem too hopeful and was clearly frustrated with my indecisiveness regarding our options. Apparently she thinks life-or-death guesses should be easy. She's ok with us trying Clomid one more time if we want to, but we don't really want to. Instead, she said to try very low-dose injectibles next time (Follistim). She's also fine with us skipping to IVF. Much as I wish IVF were a viable option for us, hubby and I agree that a $12,000+ a pop gamble is just too much given my very poor track record even when I do get pregnant. Also, having only one ovary makes it a risky gamble even without the loss issues. Guess I'll try Follistim. Why not? We have a little $ left in the insurance pot, might as well use it up and hope I have a shred of fecundity left before my lady parts self-destruct. And speaking of self-destruction, it seems to be continuing even on the pill. The pain is making me lose my mind. Endo is devastating not just because of the physical pain, but also because of the hopes it destroys. 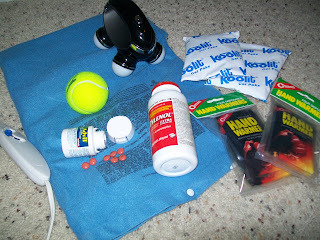 For now I'm relying constantly on my Instruments of Torture Reduction - heating pad, hand warmers for portable heat, cold packs, tennis ball, pain killers, and best of all, the portable rechargeable massager that I lay on my belly at night. There have been so many horrible decisions to make over the last few years, and each of them leads not to a resolution, but to yet another horrible decision to make. There is so much at stake. Each time we're forced to make a choice the situation is more complex and the process more tortuous. There are so many factors to consider : medical advice, physical and mental limitations, financial barriers, religious issues, ethical questions, and so much more. Someday, somehow, there will be a resolution of some kind, though I know I'll never end up where I wanted to be or with the family I wanted to have. But I want to know that at least I tried everything I could, instead of living with regrets and "what if" for the rest of my life.